NOTES: I had planned to knit up this wool and figure out how to space dye it for two-row stripes, but I ended up dipping half the mordanted hank in the dyepot with 1/4 oz of weld and letting that steep for half an hour. Next I nudged another five inches of the hank into the pot and let that steep for another 20 minutes or so. 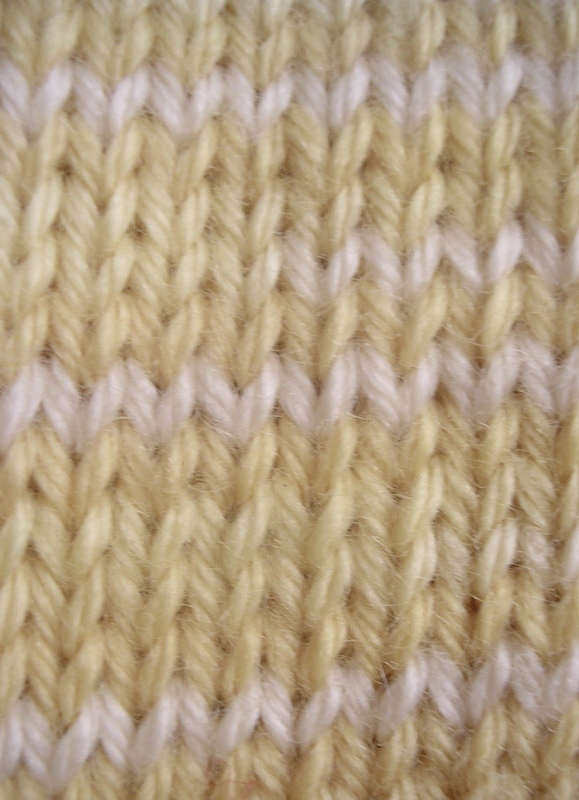 The result was this micro-stripe effect that I really like. I hope you can see the two shades of yellow. I improvised cardboard sock blockers for this pair that I think I might get a few more uses from before recycling; I simply traced around one sock onto corrugated cardboard and then cut out two. Charlene Schurch's directions for kitchener stitch are the best I've seen anywhere. I liked working the "Forethought" Heel, too. Must head over to the SKS knitalong to join and post! Sorry! Make that 4 oz of weld (not 1/4 oz). Look GREAT! Would inserting the cardboard in a plastic bad and then in the sock help them last longer? It's a great idea - I've thought of cutting out sock blockers before, but hadn't thought of a material as simple as cardboard. And the yarn is really gorgeous. You're very inspirational in pushing me towards trying dyeing. Gosh I almost underdosed the weld pot. 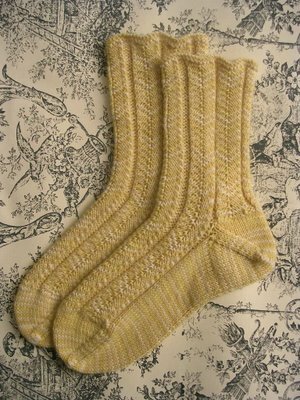 I love these old-timey delicate socks. those are beautiful! 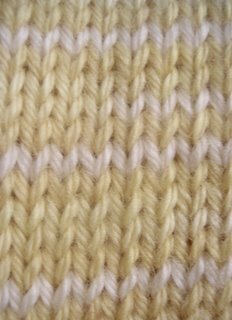 why are there so few yellow/goldish yarns? have you seen the Kaffe blurb in the new issue of Mary Engelbreit's mag? i must make one of his ribbon throws and use up my stash! or maybe i should just make striped knee socks until i run out of yarn? Nice nice nice! Love the stripey effect. Sorry to do this to you, but you've been tagged. Cheers!